Rustic is a style that we are all familiar with but classic styles can benefit from an update every now and again. 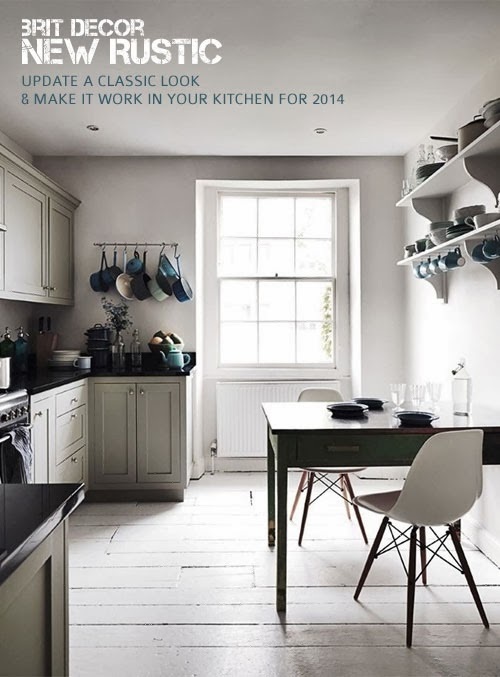 So today I am focussing on the kitchen and how to make rustic work in 2014. Importantly, don't be afraid to marry rustic with some contemporary furniture pieces such as the uber-popular Eames chairs in image 1, which blend perfectly with the Georgian-style kitchen space and its modern neutral colour palette and simple detailing. This Bristol townhouse shows us that rustic isn't just confined to the countryside and can also work well in an urban setting too. I have a love of natural wood, it's just so beautiful! Perhaps this view was biased slightly by my childhood? I remember clearly being in awe of the way in which my Granddad, as a carpenter, used to master this raw material and tame it into something so refined, elegant and functional. 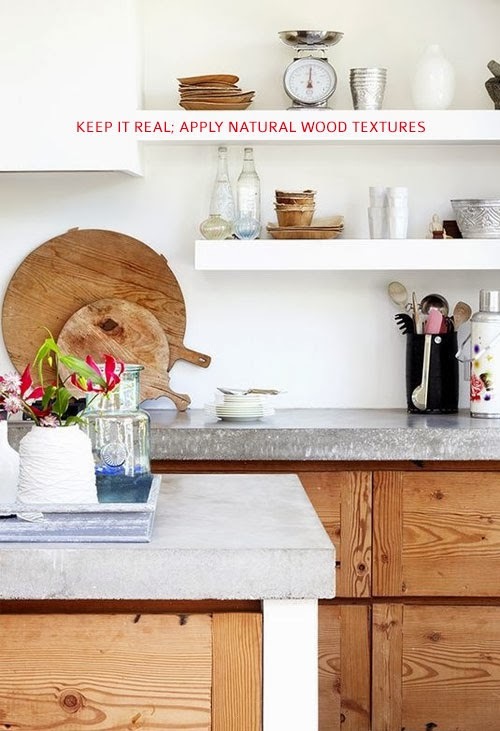 Adding wood to your rustic kitchen need not be expensive either. Up-cylced wood can look amazing when crafted into kitchen doors, or an easy way of adding wood to any kitchen is through chopping boards. Opt for a range of different sizes and put these on show as per image 2. You'll have the look working for your kitchen immediately! Be as eclectic as you want, picture a flat-packed kitchen and then think of the exact opposite! Take a sideward step away from uniformity and perfection and move towards a mix & match philosophy as shown in image 3. 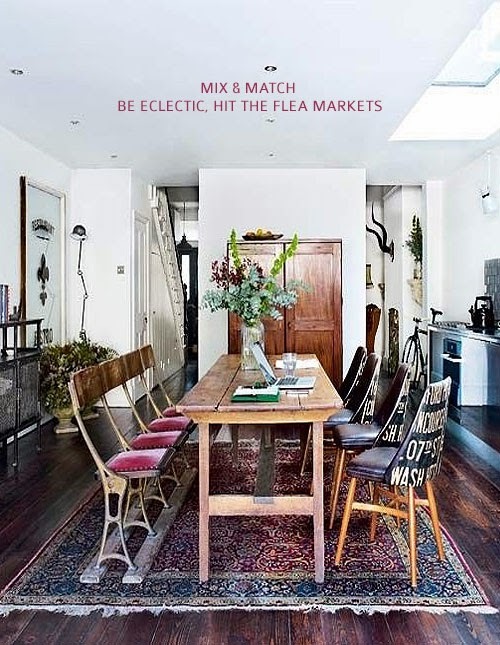 Raid your local flea markets or have fun discovering new ones further afield. Mis-matching chairs and crockery look great and add so much more interest to a scheme. Bring your cookware out to play...and press pause. 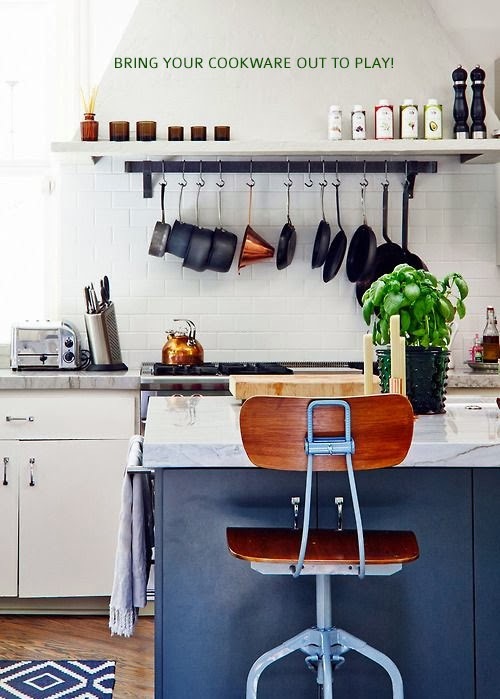 Pots, pans and cooking utensils can look pretty impressive, especially when carefully suspended on racks or stacked on a chunky shelf (see image 4). Let's not forget that rustic is also about great home cooked food so let your kitchen show that you mean business with the right hardware. Also, a freshly baked loaf of bread makes one hell of a worktop accessory! For the finishing touches, you can never go wrong with some herbs for flavour, function and fragrance, and some fresh flowers displayed in a simple handcrafted vase too (image 3). Which style kitchen are you?